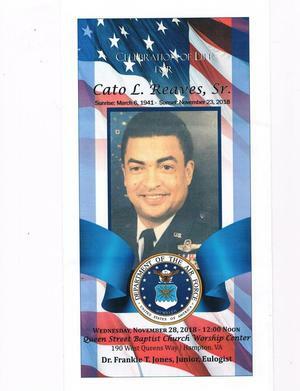 HAMPTON, Va. (December 5, 2018) - Cato L. Reaves, Sr., 77, transitioned from this life on Friday, Nov. 23, 2018. He was born March 6, 1941 to Mary Reaves and June C. Reaves. He was preceded in death by his mother and father and only brother June C. Reaves Jr.
Cato was baptized at a early age and received his formal education in Chatham County Public Schools. He attended North Carolina A&T University in Greensboro where he earned a B.S Degree in Electrical Engineering. He joined the R.O.T.C. where he received the rank of Second Lieutenant. He began his Air force career at Williams AFB, Arizona where he attended pilot training in the early sixties. He flew numerous missions over North Vietnam during the Vietnam War, as aid to the first 4 Star Black General Daniel “Chappie” James. He was afforded numerous challenges and memories. As his pilot, Cato flew him all over the United States and Canada in the F-106 and T-39 Sabreliner aircraft. At retirement after 26 years, he received the Legion of Merit Distinguish Flying Cross and many other honors. One of his fondest memories was where he was voted “Top Gun” of his class by his fellow pilots. He was a member of Queen Street Baptist Church, Hampton, VA where he served as President of the Trustees and the Male Chorus. He was recently bestowed the honor of Trustee Emeritus by fellow trustees. He enjoyed fishing and sharing the bounty with friends and neighbors. He was an avid sport fan and a diehard Dallas Cowboy fan. Cato leaves to cherish loving memories his wife of 54 years: Elaine Crawley Reaves, (2) sons: Brian Reaves (Loreen) and Cato Larry Reaves, Jr.; (3) grandchildren: Brisa, Basilio and Belicia Reaves; (1) brother-in-law: Beckwith Crawley; (1) sister-in-law: Cheryl Crawley; (2) aunts: Geneva Baldwin Vincent and Gracie Baldwin and one uncle: Charlie Baldwin, Jr.; (5) nieces: Angela McFadden (Mac), Karen Ratliff (Tony), Tracey Reaves, Amber Neighbors and Yolander Smalls; his dear friend and mentor Brigadier General Timothy Boddie, Jr., USAF (retired), a host of cousins, AF buddies and dear friends. Funeral services were Wednesday, November 28th at noon at Queen Street Baptist Church Worship Center, 190 West Queens Way, Hampton, VA. Burial will be at a later date at Arlington National Cemetery with military honors.